preheat oven to 370. Cube tofu into ½” cubes, set aside in bowl. Peel butternut squash with carrot peeler and cut into cubes. If you’ve never used a butternut squash before, the bulbous part at the bottom will be like the inside of a pumpkin. You will scrape out the seeds and stringy flesh just the same as you do a jackolantern pumpkin. Spray a cookie sheet well with nonstick spray. Toss tofu cubes and butternut squash well in a bowl with the 2 tbsp olive oil and the rosemary, black pepper and sea salt to taste. Pop in the oven and roast for 20 minutes. While the tofu cubes and butternut squash cubes are roasting, heat 1 tbsp oil in a large skillet on the stove top. Add Quinoa and heat until it becomes fragrant. add garlic, spices and veggies, sautee 5 minutes. Add water or vegetable broth (veg broth is better but contains more sodium) to quinoa package directions specifications and bring to a boil in the skillet. Simmer until all water is absorbed and veggies are cooked (about 20-25 minutes) – perfect timing! The tofu and butternut squash will probably be done before the quinoa, so remove and let cool. 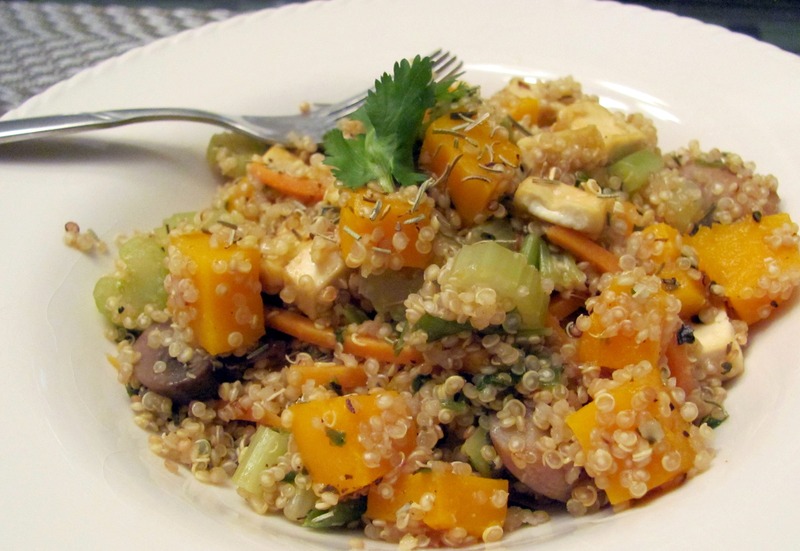 When quinoa and veggies are done, fluff and add all ingredients to a large bowl, toss to mix well and serve! This will probably make like 6 or so servings. Thank you for this recipe, I’m always looking for new things to do with Tofu! What a delicious and interesting recipe. I love alternate versions of dishes like this.